The hidden message in the jobs report: rising inequality now a structural feature of America. Summary: Journalists often report news as a horse race. For example, did a Dem or GOP win the election? This obscures important trends showing the changing nature of America. So it is with the December jobs report. Looking below the headlines shows that years of conservatives’ work has produced a new America, one with increasing and structural inequality. Unlike the post-WWII era, economic growth does not decrease income inequality (although it increases during recessions). Read the numbers and weep, or do something about it. The December jobs report show that years of well-funded, carefully planned effort by the 1% have produced a rich harvest for the 1%. Public policy has shifted from fostering growth to re-distribution — from the bottom 80% to the top 1%. A few pictures tell the story, showing how economic growth no longer provides much benefit to workers. We get more jobs, often at low wages with few or no benefits — but little or no growth after inflation. First, let’s look at the top line: job growth has increased slightly during the past few quarters. Here’s another perspective, showing the growth rate. Since the population grows, the same number of new jobs is slowing percentage growth. The growth rate has accelerated, but only slightly. With the economy growing (albeit slowly), productivity rising, and profits near record highs, wages should be rising as well. Workers should share in the gains. They did in the America-that-once-was, but do not in the New America. First, employers use the still high levels of unemployment and underemployment to keep hours low: as many as possible in part-time, and prevent over-time. (where possible we’ll look at production and non-supervisory workers, a proxy for the broad middle class). Second, businesses keep the growth in hourly wages low (these are nominal wages, before inflation). Real hourly wages grew 1.1% YoY through November (the December number is not yet out). Slow growth, and slowing growth; that’s an accomplishment that makes the 1% proud of their staff. Combine the hours and wage rates to see the growth workers’ earnings (before taxes and inflation). Average weekly earnings grew 1.4% YoY through November. Slow. Very slow. But this bleak picture ignores the good news. What about the manufacturing renaissance in America? We turn to the BLS Highlights of the jobs report for this graph showing that total manufacturing jobs are down 18% during the past 12 years, have fallen 10% since the recession began, and now grow only slowly (17 thousand in December). Perhaps manufacturing is too 20th century. In the 21 century we can get good jobs in the information industry! More correctly, we can’t. Employment in the information industry grew by only 16 thousand in 2014 YoY NSA. That’s 0.6%, slower than the overall economy. At least we know who the blame: the socialist Muslim usurper Obama, under whom the government has massively increased in size. Excerpt that it hasn’t. Let’s sum up all these numbers, as seen in the Fed’s Labor Markets Conditions Index. Do you see the boom? Me, neither. This is growth in New America: slow, with few gains for the bottom 80% even during expansions — with much of that lost during recessions. This did not just happened. A panoply of public policies since Reagan made it possible: flattening the tax system, lax enforcement of labor regulations (e.g., requiring higher wages for overtime), gutting the effectiveness of the National Labor Relations Board. Lax enforcement of illegal cartels (nobody’s going to jail for Silicon Valley’s illegal wage suppression cartel). Open borders to increase the supply of workers (including H-1B visas to suppress wages of tech workers). One result: private sector unions have been crushed. Strikes are rare (one in December), and seldom effective. Employers hold all the cards when facing unorganized workers. It’s a long list, and disproves the lie that the government redistributes income downwards. The 1% have the political power in American. They know how to use it, they have used it, and we should prepare for more changes. If we choose not to govern America, they will do so — and in their interest, not ours. (a) See all posts about economics, and those about inequality & social mobility: once our strength, now a weaknesses. The new American economy: concentrating business power to suit an unequal society, 27 April 2012. One graph that says much about America, and our future: the growth in jobs vs. food stamp use, 6 February 2013. On this Labor Day, let’s remember what unions have done for America, 2 September 2013. Back to the future in New America: our new class structure, 27 November 2013. Students, cheerleaders, & lawyers all exploited as they scramble for the few opportunities in New America, 25 April 2014. Do we have a shortage of workers, or just cheap employers? Part one of two., 8 May 2012. Do we have a shortage of workers, or just cheap employers? Part two of two., 9 May 2012. The shortage of STEM workers: another bogus crisis crafted to benefit the 1%, 28 February 2014. Previous Post Scientists speak to us about the warming pause, while activists deny their work. If or when wages ever get going, you know how it will play out in the corporate-owned media. That’s a great observation, worth attention. Note how economists speak of “wage inflation” — even when wage growth barely exceeds inflation while far less than productivity and profit growth. They’ve internalized the values of the 1%, that inflation is the evil, real wages should not grow, and rising profits show a strong economy. The most startling number for me in the Dec. jobs report was not the decent (but not great) growth in the jobs number but the 5 cent per hour drop in the average hourly wage. That is a massive drop for a single month. For the moment I am going to assume that it is caused by higher than (recent years) average retail hiring and that it will correct itself, at least in part, in the next couple of months. If it does not increase, that will represent a $20 billion drop in annual discretionary spending (before taxes). The ripple effect from that would not be a pleasant experience. (1) Too soon to worry about the drop. The error bars on these initial monthly numbers are BIG and the numbers are volatile. That’s why I show YoY changes, not MoM. In December the average hourly wages are down big YoY, but the average hours/week is up — so the average weekly earnings are flat. (2) The big conclusion we can draw: so far the recovery is not being passed on to workers. It’s nice that there are new jobs, but the vast majority already have them — and gain from more hours (esp overtime) and higher real wages. That’s NOT happening. Productivity and profits are up far more than wages. This is the tangible evidence of rising inequality. Countless articles point to the rise in inequality since 1970. That’s history. It’s still happening, despite all the chatter about inequality. That shows the power of the 1%. 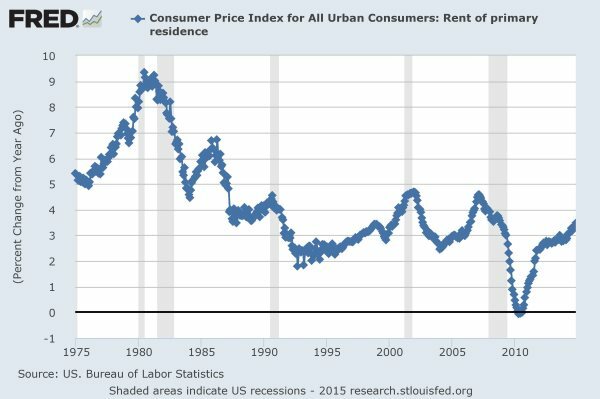 We are entering a Stable, Long-Term Deflationary Period. Firms Competing to offer identical products at the lowest possible price. Which considers Operating Costs (wages, immigration, automation, outsourcing). Seems like a downward spiral of Competitive Corporate Behavior. Will the Media focus on the Income and Wage indicators directly effecting Americans?? Looking at the price of _products_ gives only a partial view on the state of affairs. With respect to _services_ we are seeing massive increases in prices, often a multiple of overall inflation rates. Typical examples are education, health care, rent. The net effect varies enormously depending on such parameters as the age (old people buy comparatively few products but require lots of services — notably health care, home cleaning, transport, etc; ditto for young people — lots of educational and health care services) or income levels. I also object to the notion of a “Stable, Long-Term Deflationary Period” — deflationary periods are anything but stable (economically or politically). While that has been true, the deflationary forces in services have begun to weaken. Education cost growth in grade schools are rapidly slowing. In the past year or two health care costs have slowed. And housing cost (e.g., rent) still rises faster than overall inflation — but there is good reason to expect that too will slow as the boombers begin the long process of downsizing. Selling their primary asset to move into a smaller home, then into a assisted living space, then long-term care and eventually the grave. You might be right that we’re entering a late 19thC kind of deflationary environment, as many economists have forecast (e.g., Gary Shilling in his prescient 1998 book Deflation: Why it’s coming, whether it’s good or bad, and how it will affect your investments, business, and personal affairs). Perhaps I should have used the word Gradual instead of Stable. Ie. Japan case study 1998 to present. Gradual decline over a 15 year period with political stability. A note about Japan — their stability has been obtained by massive government borrowing. That’s an illusion of stability, not the real thing.